Stonewall, the UK’s leading charity for lesbian, gay, bi and trans equality, has released new research that finds a group of ‘hesitant allies’ among the British public who want to help LGBT people feel included in sport. More than half of British people (58 per cent) believe it’s important anti-LGBT language like calling someone or something ‘gay’ in a derogatory way is challenged at live sporting events. A further 53 per cent agreed we all have a responsibility to call out anti-LGBT abuse. Despite this, only a quarter of people (25 per cent) said they would feel confident enough intervening when they hear this abuse. These statistics highlight that attitudes in sporting are shifting and people want to do more to create change. Stonewall is now challenging fans and athletes to be ‘active allies’ and take action to support LGBT people in sport. As part of this year’s Rainbow Laces campaign, Stonewall has unveiled a set of top tips of what people can do to promote LGBT equality to help address this lack of confidence. These top tips include how to identify abusive language, how to effectively challenge abuse and how to report homophobic, biphobic and transphobic incidents, both on and off the pitch. Wear Rainbow Laces. Celebrate everyone in sport and make LGBT people feel welcome. Watch your language. Words have impact, so challenge chants and insults. Report abuse. Learn how to report online, at live sport events and when taking part yourself. The research also found the British public want to see LGBT inclusion at all levels of sport. Nearly two-thirds (63 per cent) said local sports club should be welcoming of lesbian, gay, bi and trans people. The research comes as thousands of fans and athletes are lacing up this month for LGBT equality in sport as part of Stonewall’s Rainbow Laces campaign. From football and rugby, to judo and darts, sports across Britain are coming together to make sport everyone’s game. Kirsty Clarke, Stonewall’s Director of Sport, said: ‘Sport is one of our strongest tools for social change, which is why it’s so powerful to see so many people wanting to do more to support LGBT people and challenge anti-LGBT abuse in sport. 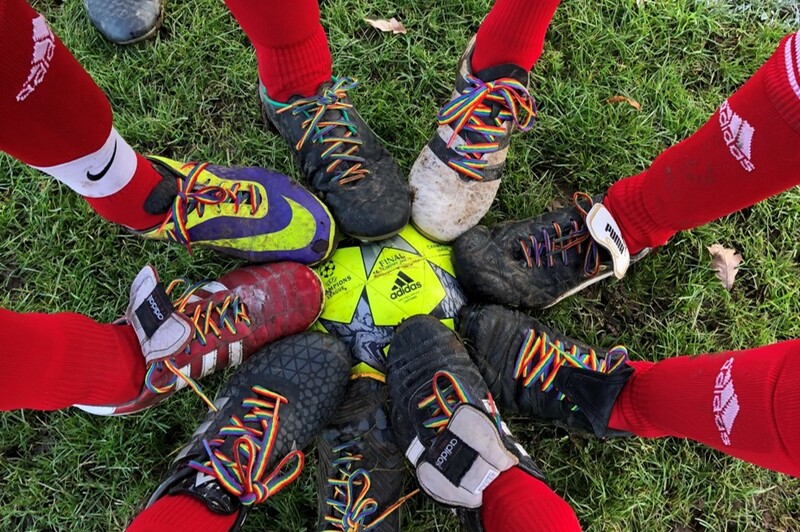 ‘This year we want our Rainbow Laces campaign to give people confidence to show their visible support for lesbian, gay, bi and trans people, either on or off the pitch. Our research shows what a huge appetite there is among people to kick discrimination out of sports at all levels. The Rainbow Laces campaign is supported by TeamPride, a group of global organisations committed to making sport everyone’s game. Rainbow Laces will be running until Friday 7 December. For more information about Stonewall please call 0207 593 1857. Find out more about Stonewall’s Rainbow Laces campaign.